Sometimes, the greatest things in life come in the smallest packages. 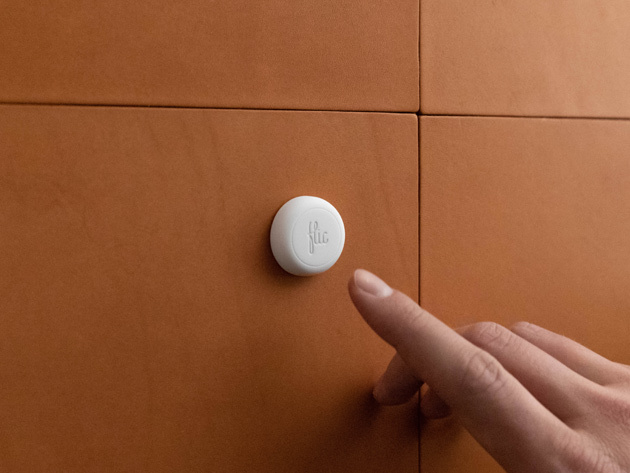 Flic, the world’s smartest button, is exactly that. Literally no bigger than a quarter, Flic is a compact and innovative Bluetooth button that provides you enhanced control over your smart devices. Pushing this one button can turn on the lights, find your phone, snooze your alarm, and much more. Don’t let the size of this button fool you. Once you set up Flic and connect it to the companion app, you can program in the desired responses to the 3 potential trigger inputs. Feel free to customize the functionality of this button based on your own personal needs. For example, you can set one output for Flic to be adjusting the light switch. Now, you don’t have to get out of bed to turn off the light; simply press Flic! Each Flic comes equipped with a wearable clip and reusable adhesive backing. This allows you to stick this device anywhere in the house. Setting up the device is really straightforward and shouldn’t take much longer than 60 seconds.